Dragonfly Song by Wendy Orr is beautifully written and different: it is an historical novel set 4,000 years ago and written in prose and verse. The switch between verse and prose is seamless. A gripping story of a girl who must discover who she is and how to use her gifts as she is sent as tribute to another land. Inspired by mythology and set in ancient Crete. I will be putting this on my textbook list. A fabulous, gripping read, written in a beautiful, lyrical style. The adventures of Aissa, the main character, carried me from moments of anguish and anger to satisfying triumph. I couldn't put this book down. As a lecturer in literacy and an avid reader, what always attracts me to Wendy Orr’s books is the positive energy that imbues them and her gift for creating rich characters and exciting stories that draw the reader into their worlds. “Dragonfly Song” is a stunning evocation of the Bronze Age, Cretan culture and the mythic bull dancers, for ages 12 up to adult. The story of Aissa, (“Dragonfly”) a mute outcast and slave of noble birth, who defeats cruelty and adversity is told through Wendy Orr’s gift for narrative, and in this story, free form poetry, which imbues the novel with a rich tapestry of characters, images and emotions.Orr shows her mastery of writing by crafting a story based on both forms of text which hold the attention of the reader; the poetry driving the narrative at a compelling pace.Orr has the ability to create heroines of high intelligence, great physical stamina and deep emotional resilience (for example: Nim, in “Nim’s Island”, Raven in “Raven’s Mountain”). Her other characters, including male characters such as Luki, Aissa’s friend are always beautifully drawn as well.The opening stanza in the book evokes seminal memories of Aissa’s birth to the Royal family.“In her dreams, Aissa feels	memory before memory, before thought or words, when she is still soft and small	and warm in her mother’s arms”and pain, when seeing her extra thumbs, a terrible deformity at that time, her father, the king cuts them off.“A dada face leans	squeezing her arms tight. A flash of silver-	pain,blood dripping from her hands	and the dada face dripping tears”.The consequences of the King’s action will be terrible, as Orr builds the community’s reaction: “Slippery as snakes, the whispers slide……”the King’s death, as the Gods punishment, the baby’s rescue by Kelya, a wise woman and her initiation into new experiences: some tender with her new family, but later, when her adoptive family is killed by raiders, brutal and cruel.How Aissa escapes living a miserable existence on the island and becomes a bull dancer and eventually finds her voice is a rich tale, full of suspense at times and played out with twists and turns that only a story teller of Orr’s talent could sustain.I could not put this book down until I found out how Aissa survives her harsh upbringing on her island as ‘no-name’ and her experiences as a trainee bull dancer and triumphant return to her island.I will be recommending “Dragon’s Song” to my colleagues and students and every reader as a unique reading experience that is also challenging and immersive. I received a copy of this title from Allen & Unwin for review.Ten Second Synopsis:Bad-luck girl Aissa has been mute ever since her family were overtaken by raiders. Despite being an outcast servant, Aissa believes that she can dance on the Bull King's island and win freedom for her people.One of the first things you notice about the physical print copy of this book is its size - at first glance, it looks like a right hefty bit of work. Don't be scared off by this however, because a good chunk of the story is told in verse. When raiders attack her family home and her mother tells Aissa to keep quiet until she returns, a very young Aissa seems to take this instruction quite literally, resulting in her selective mutism. The verse sections of the novel deftly give poetic voice to Aissa's inner feelings and experiences, in a way that might, in a more typically formatted novel, happen through dialogue or introspection. The book is split into two parts. The first, much longer, section details Aissa's upbringing as the "cursed child" of her island and the ways in which she tries to carve out a life for herself in an openly hostile environment. We learn here about some special talents that Aissa possesses, but doesn't fully understand or recognise, and as readers, we are also privy to information about Aissa's family heritage of which she herself is unaware. The second part of the book takes place on the Bull King's island and moves much more quickly than the first section. This part of the book is quite action packed compared to the story set on Aissa's home island and deals with Aissa finding her true calling and tying up loose ends regarding her identity. There is plenty to get one's teeth into here for fans of historical fiction who are looking for something set in a past a bit more distant than Victorian times. The culture, rituals and daily lives of the people of this time and place are really brought to life through Orr's writing and the addition of verse certainly adds in building the atmosphere. I'd have to recommend Dragonfly Song as the perfect way to escape on an adventure if you aren't lucky enough to be travelling somewhere exotic yourself. Sometimes you read a book that bowls you over — for me, Dragonfly Song by Wendy Orr (author of Nim’s Island among many other titles) is definitely one of those books.Dragonfly Song is Junior fiction and what I would describe as “legendary history”, i.e. it draws on what we know of real history, but also invokes the stuff of legends, in this case those of Bronze Age Greece/Crete, and includes at least a hint of magic.The book tells the story of Aissa, the daughter of a priestess-queen who is cast out at birth and must learn to survive in life’s school of hard knocks. Later, she is selected by lot as a tribute to the Minoan kingdom of Crete where she must learn to “dance with the bulls” — or die.The story is well written and well researched, but what makes it special is the “voice” and character of Aissa. I also loved the way the story is told, in a mix of prose and poetry — or at least prose that is poetic in form. It’s also a book with a great deal of what I call “heart”, which comprises both the integrity of the characters and the emotional depth of the story.In short, I think Dragonfly Song is wonderful: I loved it.If you enjoy historical fiction by writers such as Rosemary Sutcliff or Gillian Bradshaw, or fantasy works such as those by Patricia McKillip, Philip Pullman’s The Golden Compass, Tamora Pierce's "Lioness" series, or my own Thornspell, then you may enjoy Dragonfly Song, too. Full disclosure: I *really* wanted to love this book, because I love Wendy. So I began with huge amounts of trepidation, consoling myself by thinking, "If I don't like it, I just won't review it." I started it last night ... And mainlined it this morning from 4:30 am onwards. This book got me in the "emotion place" big time. I read most of it with my hand on my heart. I loved the Nim books but my favourite Wendy Orr has always been Peeling the Onion. This book affected me every bit as much as that one. I fully expect I'll read it again soon because I feel like there's so much more to discover. With huge relief, I highly recommend it. This is a unique middle grade story.I love Greek mythology so I loved how this story was done in the style of a traditional Greek epic. A lot of the story was told in verse, like the epic poems The Odyssey or The Illiad. This style may be unusual for many young readers, but it will expose them to a traditional style of writing. Orr does a great job of weaving verse in with the prose of the story. Many other aspects of Greek mythology also appear in the story, such as sacrifice and animal imagery. Though Aissa’s story is happening centuries ago, she still faces issues that contemporary children have to deal with. Young readers could relate to her problems with bullies. She is bullied by Half-One and Half-Two and is eventually kicked out of the servants circle. I really enjoyed this story. However, if I read it when I was in elementary school, I don’t think I would have liked it as much. This story would be a great introduction to the Ancient Greek style for young readers, if they also have some guidance from an adult. I received a copy of this book from the publisher in exchange for a review. This is an engrossing and beautifully written tween or YA novel about the first thirteen years in the life of a Bronze Age girl. Wendy Orr has chosen to slip between verse and prose as she tells this tale. The decision is an inspired one because for the early section we are looking through the eyes of a baby and then a 4 year old child, and in the later part through the eyes of a voiceless girl. So here a more intuitive use of language is ideal rather than formal sentence structures. The verse makes the experience more intimate; more like the thoughts and impressions of a non-verbal person. And it's also used to great effect in painting the harsh but beautiful landscape, the bustling and brutal island civilisation in all its poetry.The plot moved smoothly and purposefully to a logical and satisfying conclusion with plenty of action along the way. There's much to think about and we see human nature at its worst, or just about. But the telling is sympathetic and we are left with a sense that civilisations are ours to make as we choose. And both courage and kindness can make a positive difference. I must admit, I enjoyed this book, it is about a young girl who doesn't have a lot of luck growing up back thousands of years ago in Crete. She is however destined for more out of life then she starts out getting. And so with this book we get some historical fiction, generous sprinklings of mythology and a good dollop of action later on in the story...so I was always hopeful of a good read with all these ingredients.Why the dropped stars? From a personal point of view, and know others will give more credence or praise for this, but the regular sporadic use of poetry and verse put me off. That's just me. I also, and reason I selected this book was to share a little with my young son (8) as he loves anything with Greek mythology in it. But he never got into or showed any interest in this, but aware this is aimed more at YA then him, so meant I read majority of this on my own.So a well written, interesting read and one that has introduced me to a good author I will keep an eye on. Beautiful, wonderful and stunning. I loved loved loved the history in this book An excellent read that inspires me deeply. Loved this book! The story and characters were fascinating andI especially liked the mix of prose and verse. Historical fantasy at its best. I finished this book at a cracking pace. I literally devoured it. Wendy Orr's writing is exquisite. Moving, deeply connected and a great story. The pacing slows about half way through but you appreciate the time taken by the time you finish. This was kind of a hard book to review, mostly because it almost falls between genres. It's classed as an upper Middle-Grade historical fantasy, which, that's not wrong . . . I felt like it had more of a classic children's fiction feel to it. It's coming-of-age, and also a sort of epic hero's journey, straddling children's lit and YA in a way that's often done more by adult literary works. It touches on many 'big ideas': deformity, religion/society, acceptance, adoption, trauma, bullying, disability, purpose/identity, fate . . . The format is creative and unique. The story arc stretches from the MC's birth to age 14 and is told in omniscient third person varying with passages in verse. I'm not sure if there was a meaning to the alternating styles; at some points, I thought the dreamlike verse passages were meant to show the MC's perspective in a closer, almost experiential or sensory format as an infant, a toddler, a mute child . . . but then that didn't necessarily carry through, so perhaps it was more to craft an atmosphere for the story. The setting is the ancient Mediterranean, and the story picks up on legends of bull dancing. The world feels distinct, grounded and natural, without heavy-handed world-building. It's a world of gods and priestesses, sacrifice and death and surrender. Humans seem very small within it, and as a children's book, it's challenging rather than comforting. There's death and violence and loss, handled in a very matter-of-fact manner, so I'd recommend it for maybe ages 10+, depending on the child. It's not gratuitously violent or graphic, but it's a raw-edged ancient world where killing a deformed child, having pets eaten by wild animals, beating slaves - including children - and sacrificing people as well as animals to the gods is just part of life. I was very kindly sent a hardcover edition via the Goodreads Giveaways program, and the book production is lovely. It has a bold, graphic cover with some nice foil accents, a printed board cover (which I prefer for kids books due to the durability), fully illustrated internal section pages, and pleasant, spacious typesetting. Confident, mature young readers will find this an engaging, challenging and meaningful read with an inspiring story arc and some lovely writing. Hesitant readers and very young readers will probably find it a struggle. I'd give it 5/5 as a product, 4/5 as a literary work and 3/5 as kid's entertainment. Dragonfly SongWendy Orr~historical fiction, childrens, Minoan era, rejection, acceptance, determination, Bull Dancers, magicAissa is the firstborn daughter of the island's Priestess...but she's born with a minor deformity and should have been cast from the cliffs. Instead, the wise woman who takes her places her with a family that had just lost a baby. When she loses her adoptive family to raiders, she is dumped at the gates to the Great Hall...mute and unknown. She becomes No-Name, a slave of slaves - despised and spat upon by all.The Bull King of the far-off Minoan-esque empire demands tribute from the island: food, animals, gold, and a boy and a girl of 13 to become Bull Dancers. When she comes of age, No-Name sees her chance to leave her life of an outcast behind...if she can be picked as one of the Bull King's tributes.This story is told part in narrative verse and part in prose. There is a lot of despair with tiny moments of hope in the first part of the book. There is confusion and triumph and hard choices in the second part.What choices does a slave girl really have? And how can she discover her voice?Very good book! This review has been crossposted from my blog at The Cosy Dragon . Please head there for more in-depth reviews by me, which appear on a timely schedule.A little girl is left under a bush with no voice after raiders take her adoptive family. She is the only one to survive – and so she is relegated to the bottom of society and bullied mercilessly. Her one chance at escape is to take part in the Bull Dancing – but it is a perilous task that no one seems to know how to prepare for.Nooo! Past me, why did you not write notes on what you enjoyed about this novel? I could have sworn I had some notes sitting in my draft folder. Ah well. I can tell you that this was an excellent example of teenage fiction, and I really enjoyed it.I snatched this novel from the top of a new pile of bookies that came in, and devoured it. I wanted something light and easy to read and this fit the bill. I curled up on a warm couch and read it in one breathless sitting. I didn’t know what would happen next, and what horrific things would be justified in speaking to a ‘cursed one’.Something I didn’t enjoy about this novel were the poetry sections. I’m never a fan of poetry anyway, and here, the poetry tried to be good (in fact, it might have been good poetry, I’m not a connoisseur) but for me it distracted from the otherwise beautiful prose of the story.I’ll be keeping this novel for future generations. I felt that it had real potential as both a teaching tool (bullying is bad), but also a great storyline that didn’t turn out how I expected it to. I’ll be giving this 4 stars, not 5, only because I probably won’t reread it. This book has been shortlisted for the Australian Children's Book Council Younger Readers book of the Year.This is the last of the younger reader books I've read. It took me a bit to get going with it, but once I did I really enjoyed it. Wendy Orr uses a stream of conciousness style to let the reader know what Aissa is thinking and at times I found it broke the flow of the story. Once I settled into these almost verse like interludes occuring I found I really enjoyed the book.I love that Orr presented a complex story to the reader. Aissa's journey takes many twists and turns and things don't always happen the way you think they will. More importantly, Orr creates strong female characters with resilence, perseverance and intelligence as their strengths. She doesn't shy away from portraying life as hard and cruel for those who have the misfortune to be at the bottom of the totem pole in a community. But her characters triumph despite their hardship and they usually do it without losing the kindness and humanity they are imbued with. Dragonfly Song is a stron book that treats it's reader as an intelligent being, worthy of a good story. Abandoned by the priestess of the island at birth, Aissa is an outcast, surviving by her wits - until she joins the acrobatic bull dancers who are sent away to compete on the island of the Bull King. There are two ways of looking at Aissa's story. She's the miracle girl who escaped the raiders. Or she's the cursed child who called the Bull King's ship to the island. The firstborn daughter of a priestess is cast out as a baby, and after raiders kill her adopted family, she is abandoned at the gates of the Great Hall, anonymous and mute. Called No-Name, the cursed child, she is raised a slave, and not until she is twelve does she learn her name is Aissa: the dragonfly. Now every year the Bull King takes a tribute from the island: two thirteen-year-old children to brave the bloody bull dances in his royal court. None have ever returned - but for Aissa it is the only escape. Aissa is resilient, resourceful, and fast - but to survive the bull ring, she will have to learn the mystery of her true nature. If you are into stories that have Greek mythology as a base and/or you love strong female characters that remain true to themselves even while enduring almost unbearable hardships, then this might be the book for you. Aissa should have been the next high priestess but as she was born with an extra thumb on each hand, her mother took it as a bad omen and she was cast out. Aissa survived but became the "lowest of the low" and was worked from morning til night, taunted, beaten and treated as a "no-one" - she was so low that she was known as "No-name". Aissa had a special gift and managed to survive in the community until she was taken by the Bull king's people as a tribute to compete in the bull dances (of which very few ever survived). Parts of the novel are written in free verse, these contain Aissa's pared down observations and thoughts. At first I found these parts distracting but I soon started to really enjoy them. They moved the story along quickly and gave you more of an insight into Aissa. I had trouble putting this book down, the imagery and characters kept me so captivated.Aissa is such a strong central character, watching her grow through the book , dealing stoically with all the twists her life throws at her. I love the mysticism mixed in with the very real life of the characters,the love of the history of the times is very evident in Wendy Orr's writing.The use of open verse for Aissa's voice works very well, in some exciting passages I couldn't believe how fast I read them, the passages flowed so much faster than prose would. I would highly recommend this book , for readers of all ages who enjoy adventure, history, a bit of magic and characters that come to life amidst wonderful descriptions of a life and culture from long ago. 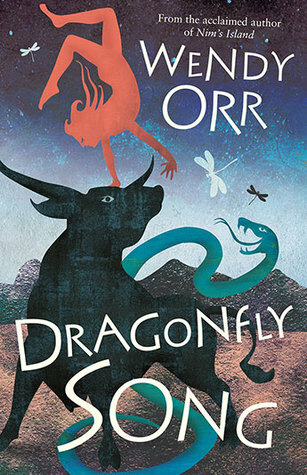 Orr once again has created a strong female heroine, with what I would consider her trademark mastery of the written word. I had the absolute pleasure of being able to read a prepublication review copy of "Dragonfly Song" by Wendy Orr in anticipation of its October release date by Pajama Press. I generally don't like free verse so I was pleasantly surprised how well the author integrates it seamlessly into her story making you feel like without it the story would not be complete. Being on maternity leave with a three week old and a toddler my days are generally a blur; but once I picked up this book and started it I could not put it down!! The story is intriguing and the writing is exquisite; sucking you in from the very first page. The absolute perfect book; closing the back cover leaves you sighing with contentment at how completely she finishes the story. What an incredible storyteller Wendy is. This story had me hooked from the beginning. From the main characters entry into the world and her life from that point on, to the setting, the time period, the format. The whole story had me riveted. I read the last two chapters over breakfast one morning. As I closed the book at the end of the last chapter, tears streamed down my cheeks. Happy tears. I wanted to read the book all over again and not move on to the next on my 'To Be Read' pile. Perhaps I shall. An unexpectedly fantastic read! At first, the passages of free verse were disconcerting but as the story grew, they wove their way expertly into the fabric of the tale. Aissa's blend of innocence and determination is powerful to read; Luki's kindness and humble aspirations a perfect foil. It was easy to invest in these characters. Wendy Orr - I’m an author, but I could never have started writing books if I hadn’t loved reading them first. Reading isn’t just one of my favourite things to do; it’s one of the most important things in my life. I can’t imagine a world in which I couldn’t read, every day. That’s why I always read to my children every day, just as my parents used to read to me. Stories can be exciting, sad, funny, scary or comforting, but the most amazing thing about them is that they take us into new worlds and teach us something more about ourselves, all at the same time.